For CTP to be effective and successful, it must suit the context. The decision of using in-kind, cash programming, or a combination of modalities will be based on situational analysis outputs and a comparison of the relative risks and benefits of different transfer modalities (in-kind and cash based), cost-efficiency, and potential effectiveness. This includes timeliness, the skills and capacity necessary to implement cash programming, and their coherence with other aid programs. A team trained in CTP. Below is a table with the potential advantages and disadvantages of each CBI modality, those should be contextualized. Choice and dignity – cash allows recipients to decide what they should spend the money on. This enables people to choose what they most need, and allows for this to vary from person to person Less control from the women – women may be less able to keep control of cash than alternatives such as food. If this challenge is overcome by distributing the cash or the voucher to women, protection risks should be closely monitored. Cost effectiveness – for CARE and the beneficiaries as logistics costs are lower. Lack of skills – in context where CBI has not been used before, the team may not be fully proficient hence creating delays in the set up of the project. Lack of knowledge can also lead to resistance from the team to use CBI to deliver the project. 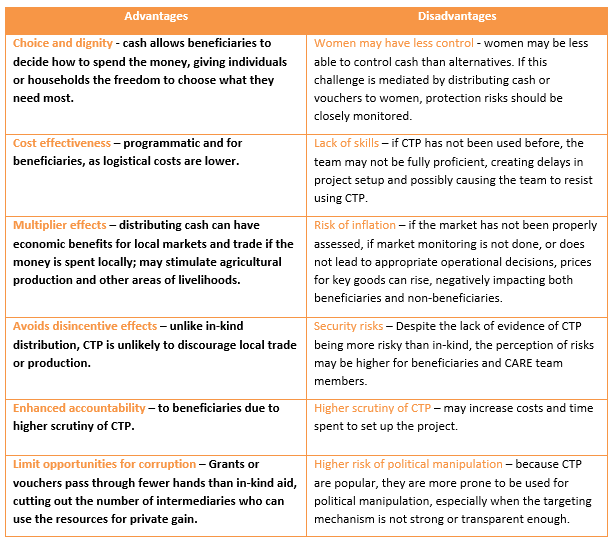 Multiplier effects – distributing cash can have knock-on economic benefits for local markets and trade if the money is spent locally, and it may stimulate agricultural production and other areas of livelihoods Risk of inflation – if the market has not been properly assessed or if market monitoring is not done or does not lead to appropriate operational decisions, prices for key goods can rise, negatively impacting both beneficiaries and non beneficiaries. Avoids disincentive effects – unlike in-kind distribution CBI is unlikely to discourage local trade or production. Security risks – Despite the lack of evidence of CBI being more risky than in-kind, the perception of risks may be higher for beneficiaries and CARE team members. Enhanced accountability – to beneficiaries due to higher scrutiny of CBI. Higher scrutiny of CBI – may increase costs and time spent to set up the project. Limit opportunities for corruption – Grants or vouchers pass through fewer hands than in-kind aid, cutting out the number of intermediaries who have the opportunity to use the resources for private gain. Higher risk of political manipulation – because CBI are popular, they are more prone to be used for political manipulation, especially when the targeting mechanism is not strong or transparent enough. Adjusting grant amount by household size may be considered. Resources and political feasibility determine the size, frequency, and duration of the scheme. Grants can be used to support existing social protection schemes, and amounts can be calculated collaboratively within cash working groups. Quantify the needs: either through a Minimum Expenditure Basket (MEB), the use of Sphere indicators, the survival line, the poverty line, or the Cost of Diet methodology. Factor in the household capacity to cover the identified needs either through their own resources or with external aid. Define the grant amount: the need minus the household capacity. Payment per unit is based on a clearly measurable output. This can include metrics including number of acres cleared, houses built, volume of debris removed, or kilometres of road rehabilitated. Lump sum payment provides a fixed payment for a pre-determined timeframe. Based on an estimate of the amount of time required to complete a job. A bill of quantities is used to estimate labor/material requirements and the related costs for achieving an intended output. Daily wage payment provides flexibility and is often used when activity duration is uncertain. Implementing teams should consider urgency of need, protection risks for beneficiaries when receiving large payment, capacity of payment agent(s), and project objectives. When beneficiaries need cash immediately, payments may be transmitted weekly or even daily at first, then transitioned to a less frequent basis (weekly, every other week, or monthly). When the project aims to support a community with livelihood assets replacement, payment can be made once an appropriate amount is determined. The decision regarding grant amount and payment frequency is the responsibility of the CARE Project Manager and the Team Leader. Choosing the payment mechanism or payment agent: bank, post office, mobile phone company, transfer company, cooperatives, traders, direct cash distribution by CARE or its implementing partner. Choosing the payment instrument: direct cash, ATM card, check, wire, mobile phone or voucher. 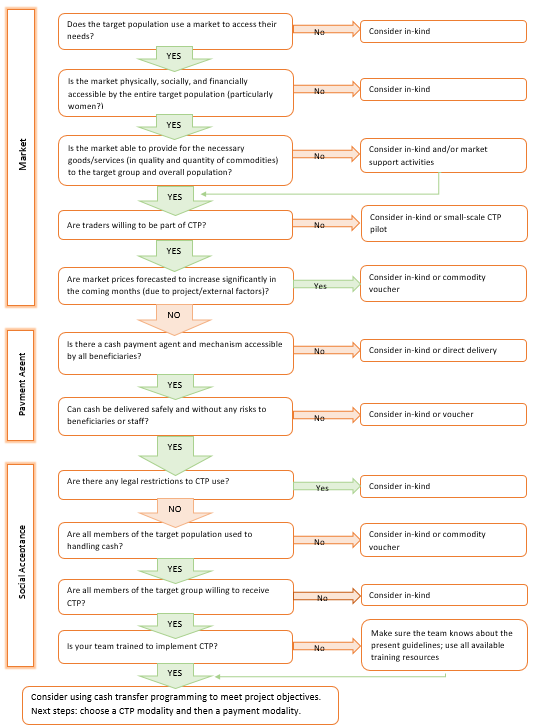 The choice of the instrument will be dictated by the choice of the payment mechanism but some payment agents can offer several instruments (e.g. a bank can offer direct cash, check, ATM card or wire). Failing banking system and absence of other reliable payment agents.